Entries cover every country of the world, with particular emphasis on the larger nations, as well as Indonesia and the Latin American countries that are traditionally given little attention in English-language reference works. 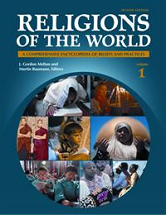 Encyclopedia also covers the world of religious unbelief as expressed in atheism, humanism, and other traditions. Includes Detailed statistical information on the major religious communities in each country, entries on religious sites and places of pilgrimage, biographical sketches, maps and bibliographies.